Chic & Basic Tallers Hostal i Barcelona, Spania: Bestill nå! Kun eiendommer med vurderinger i de siste 12 månedene får en karakter. With a minimal design and enchanting details, and with its services, location and design, chic&basic Tallers is much more than a hostal. 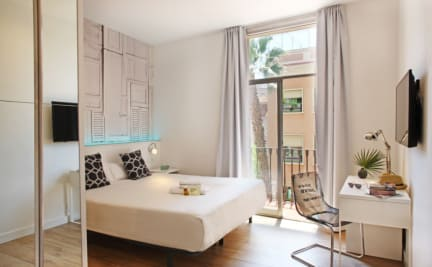 Located within five minutes walking distance from Plaça Catalunya, you will be located in the centre of the city with direct connections to the most interesting places to see. 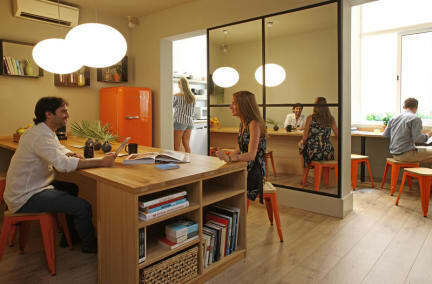 The rooms are basic and tasteful with all the conveniences you will need to feel comfortable. They are all appointed with TV, air-conditioning and heating, a complete bathroom, as well as our audio system that will allow you to listen to our exclusive music channel or connect your iPod.